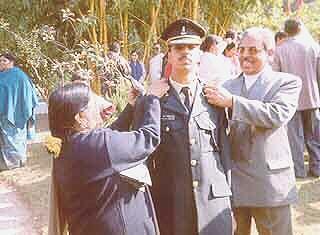 Born in Palampur district in the Kangra Valley of Himachal Pradesh, Captain Saurabh Kalia was brilliant in academics and effortlessly secured scholarships throughout his schooling years. After completing his graduation in May 1997, Saurabh was selected in the Indian Military Academy, Dehradun in August 1997, through the Combined Defence Services and was commissioned on December 12, 1998. 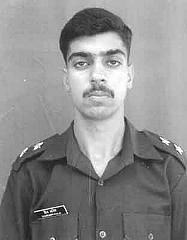 Lt. Saurabh Kalia of 4 JAT Regiment of the Indian Army laid down his life at the young age of 22 for the nation while guarding the frontiers at Kargil. His parents, indeed the Indian Army and nation itself, lost a dedicated, honest and brave son. subjected to unprecedented brutal torture, evident from their bodies handed over by Pakistan Army on June 9, 1999. The Pakistanis indulged in dastardly acts of inflicting burns on these Indian officers with cigarettes, piercing their ears with hot rods, removing their eyes before puncturing them and breaking most of the bones and teeth. They even chopped off various limbs and private organs of the Indian soldiers besides inflicting unimaginable physical and mental torture. these brave sons of India . I am afraid every parent may think twice to send their child in the armed forces if we all fall short of our duty in safeguarding the PRISONERS OF WAR AND LET THEM MEET THE FATE OF LT.SAURABH KALIA. Dr. N.K. Kalia (Lt. Saurabh Kalia's father).